The expertise, skill, and passion of Dr. John Moor - Sarasota’s knee and shoulder specialist – are evidenced by his accomplishments as an orthopaedic surgeon in Florida and beyond. He is the only dual-fellowship-trained (in arthroscopy and shoulder surgery) orthopedic surgeon in Sarasota, and he trained at the world-renowned Steadman-Hawkins Clinic in Denver (patients included the Denver Broncos, Colorado Rockies, and US Ski Team) and the University of Iowa’s Hawkeye Sports Medicine Center. Dr. Moor has earned national recognition as one of “America’s Top Surgeons” by the Consumers’ Research Council of America. He has also been a guest speaker at national orthopaedic conferences, and he’s had the honor of teaching international orthopaedic surgeons with the Arthroscopy Association of North America. Other achievements include being an elected member of the American Orthopedic Society for Sports Medicine, an editor for the Journal of Shoulder and Elbow Surgery, and an associate professor at Florida State University’s College of Medicine and Lake Erie College of Osteopathic Medicine. 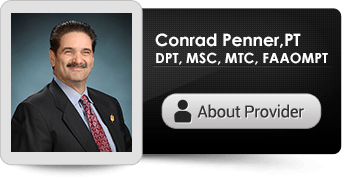 Although his expertise lies in arthroscopy and joint replacement of the knee and shoulder, he also treats many other areas of the body in his practice as an orthopaedic and sports medicine doctor. Patients of Dr. Moor come from all over the United States and include professional athletes, college sports teams, and Olympians. He also sees young athletes with sports injuries, middle-age weekend warriors, and senior citizens needing hip and knee replacements. With such a diverse skill set as an orthopaedic physician and sports medicine doctor, patients of Dr. Moor need not go anywhere else for their orthopaedic and sports medicine conditions. 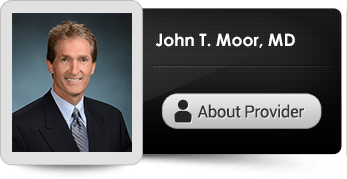 Dr. Moor is passionate about his career, and he leads an active lifestyle with his wife and four children in Florida. He was an athletic child and student who loved sports, and his abilities were recognized with a Division I football scholarship to Kent State University. In his spare time, Dr. Moor coaches basketball, baseball, and soccer and attends local sporting events with his family. A certified athletic trainer (ATC) is an allied health care professional that provides injury and illness prevention, wellness promotion and education, emergent care, examination and clinical diagnosis, therapeutic intervention, and rehabilitation of injuries and medical conditions. Athletic training is recognized by the American Medical Association (AMA) as a healthcare profession. 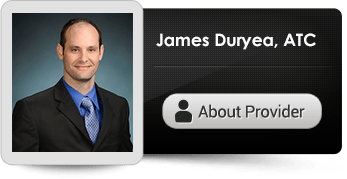 James has been a member of Dr. Moor’s medical team since 2005.